As far as first announcements go, that one is pretty good. I’ll break down the announcement alphabetically and give my thoughts. 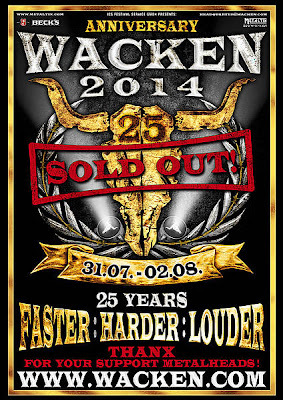 While typing this blog, it was announced that Wacken 2014 is sold out! That is amazing news! 75,000 tickets gone in less than 2 days. AMON AMARTH – They played Wacken in 2012 and had a really good set. Their Download 2013 set was plagued with sound problems. I’d give them another watch if they didn’t clash with anyone. I am surprised to see them booked again so soon. APOCALYPTICA – Really quite happy with this booking, especially considering it is a one off show with a full orchestra. It is likely the closest I will ever get to seeing a Metallica song played with an orchestra! ARCH ENEMY – Pulled out of all their Summer 2013 dates including Wacken, so this is to make up for that. I am happy to see them on the line up. I would still like to see them do a headline tour of the UK but no matter! There is time for that later. AVANTASIA – I am over the moon with this announcement. I thought they were nailed on for this year’s festival when they started announcing festival dates but it was not to be. Clearly this is why. Hoping they get at least a 90min set – that would be cool. I of course would not be opposed to them getting longer like Judas Priest did in 2011. BEHEMOTH – I haven’t listened to much Behemoth. I have tried to get into them before and failed. I just gave them another go and what I listened to seemed alright (as far as death metal goes). CHILDREN OF BODOM – A band that I’ve seen a couple of times but haven’t seen for a while. They played Wacken 2011 but late at night. I wonder if they’ll have a similar slot this time – hopefully not. EMPEROR – This is a huge announcement for Wacken 2014. I suspect they won’t be playing many more shows so for one of them to be at Wacken is big news. I like some of their stuff. The album I suspect they’ll be playing in full seems pretty decent. ICED EARTH – I saw the last ever Iced Earth show with Matt Barlow at Wacken 2011 and it was ace. I am yet to see the band with their new vocalist but that’ll be resolved when they support Volbeat in London. I am happy with this booking. KING DIAMOND – King Diamond was someone I hoped would play Wacken 2012 after he was announced to headline Bloodstock. It didn’t happen but that’s ok because he is booked here! Would be good to see him. KREATOR – I’m not gonna lie, I’m completely okay with this booking. I’ve seen Kreator 3 times now, including a headline show and I really enjoy them live. Last band of the Saturday again like they have been the last two times I’ve seen them at Wacken? That would be cool. PRONG – I don’t know much by Prong but what I have heard I’ve really liked. They could be well worth a watch. So that is the first announcement and it is a corker. 11/12 bands I want to watch – can’t grumble about that (especially when one of them is Avantasia). Below is my wish list of bands that I would like to see get announced. I know I won’t get them all, or maybe even any of them but it would be nice to get some. If that entire list was booked, I’d be in clash hell. If some of them could be booked though that would be grand. It will be cool to see who they book that I’ve never heard of though because I like to check out new bands all the time. 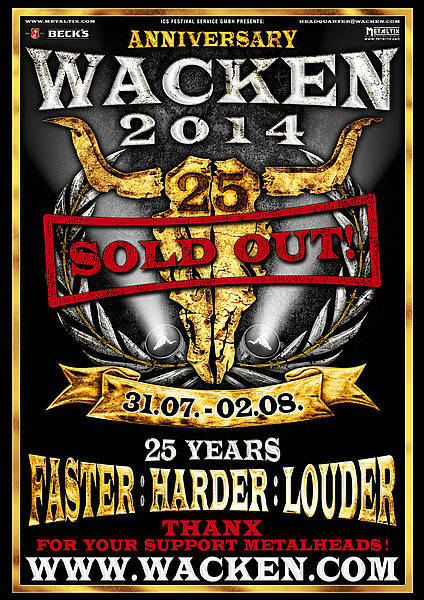 The next announcement for the sold out Wacken 2014 is toward the end of September during the Hamburg Metal Dayz event. The next big announcement after that will be the advent calendar. I suspect I will do blogs for both of those announcements.